858 George Street Motel Dunedin is an architecturally designed, multi-award winning motel complex, located on the main street of Dunedin City. We provide a range of Luxurious Studio, Executive and Family Units and one Accessible Unit. 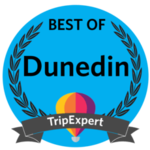 Centrally located, this Dunedin motel accommodation is within easy walking distance to the University of Otago, Otago Polytechnic, Otago Museum, Botanic Gardens, Forsyth Barr Stadium, Dunedin Hospital, Cafés, Restaurants and the city’s main retail centre.